In the realm of handmade crafts, I have been wanting to make a hanging mobile for a very long time. I just love suncatchers and I love mobiles. But was never really quite sure I could pull it off. Well I have made my first one – it now hangs happily in our garden and it turned out much better than anticipated. OK – I love it! Making a sun-catcher is not so hard – just a few crystals to catch the glory of the sun. 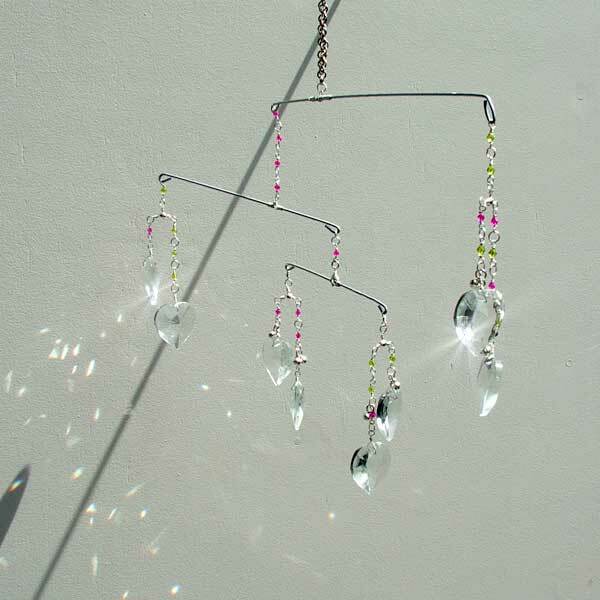 But I wanted a mobile that would hang well, would sway gently and would allow the crystals to swing in the breeze. 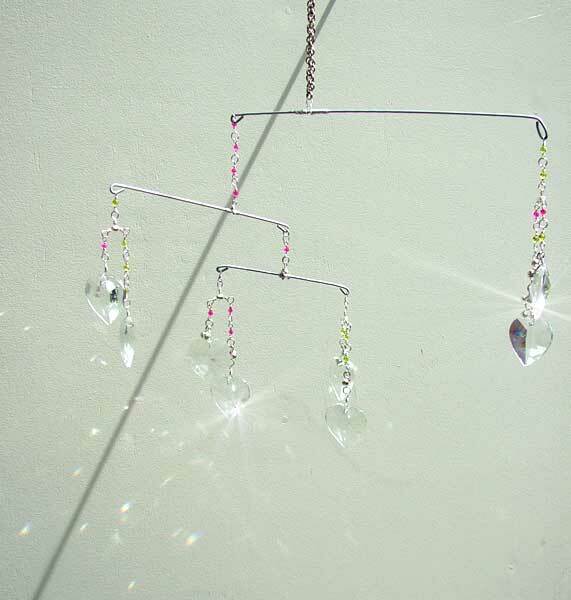 And yes, if possible – a hanging mobile suncatcher that I could have out doors. As this is my first experiment, I didn't take a lot of pictures of the process as I was winging it as I went. I got me one of those dry cleaners aluminum clothes hangers. I cut 3 lengths – Long, Medium, Shorter. I tried using a large strong regular cutter but that didn't work so well. So I finally used a memory wire cutter and that worked fine. Then with a very strong pair of pliers, I curved each end of the lengths to make a loop. For the swinging crystals part, I was lucky enough to have some fairly large 3-prong swivel barrels (there might be a better name for it. I once knew it but can’t remember now – but you can get them from fishing shops). Then make TWO 3-prong heart crystals hanging – made random lengths for each heart – wire looped with small crystals as part of the drop that leads to each crystal heart. End each of these off with the large bottom heart crystal. Therefore 2 heart crystals to each of the 3-prong swivels. Attach the two 3-prong heart crystals to the shortest clothes wire. This will be the bottom tier. START WITH THE BOTTOM TIER FIRST. Hang this off one end of the medium length clothes wire. Make your next 3-prong swivel hearts crystal and attach it to the other end of the middle tire clothes wire. Now you have 2 tiers. Make the next (last) 3-prong swivel heart crystal. Hang it off one end of the top (longest) clothes wire. Now you have to figure out where along the middle tier you are going to attach the top tier – it will be approximately 1/3 along the middle tier. You have to kind of play around with this to see how the mobile sits – you don't want it to be too lop-side. When you get the the correct positioning, attached and fix the top tier to the middle tier with wires – tightly. I also added glue to each spot where each tier attached to the next for extra security. Finally make a length of chain to hang off the top tier and with which you can then hang off somewhere so that your mobile can hang freely. It can even be a strong string of some kind. I just want my mobile to be “all of a kind” – so I made a handmade chain from which it could hang off. Below is a video I took of my mobile heart suncatcher. My very first video that, to be able to display it here, I uploaded to YouTube. So it is not a very great video and I also did not realize I was capturing the TV background sound. However you will be able to see the mobile in action and its sparkling interplay with sunlight.